An electrochemical biosensor was developed to determine formaldehyde (HCHO) adulteration commonly found in food. The current responses of various electrodes based on multiwalled carbon nanotubes (CNTs) and synthesized nanocomposite (CNT–Fe3O4) were measured using cyclic voltammetry. The nanocomposite based biosensor shows comparatively high sensitivity (527 µA mg/L−1 cm−2), low detection limit (0.05 mg/L) in linear detection range 0.05–0.5 mg/L for formaldehyde detection using formaldehyde dehydrogenase (FDH) enzyme. In real sample analysis, the low obtained RSD values (less than 1.79) and good recovery rates (more than 90%) signify an efficient and precise sensor for the selective quantification of formaldehyde in orange juice. 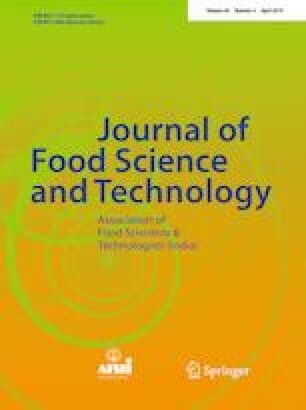 The developed biosensor has future implications for determining formaldehyde adulteration in citrus fruit juices and other liquid foods in agri-food chain to further resolve global food safety concerns, control unethical business practices of adulteration and reduce the widespread food borne illness outbreaks. The online version of this article ( https://doi.org/10.1007/s13197-019-03635-7) contains supplementary material, which is available to authorized users. We sincerely express gratitude to Director, CSIR-NPL, New Delhi, India for providing the research facilities and encouragement. We are grateful to Mr. Jai Singh and Mr. Dinesh CSIR-NPL for SEM and TEM measurements respectively. The sponsorship support received from ICAR-IARI, New Delhi, India is gratefully acknowledged.